Altogether now: “We’re all going on a..”. No, can’t see that catching on. 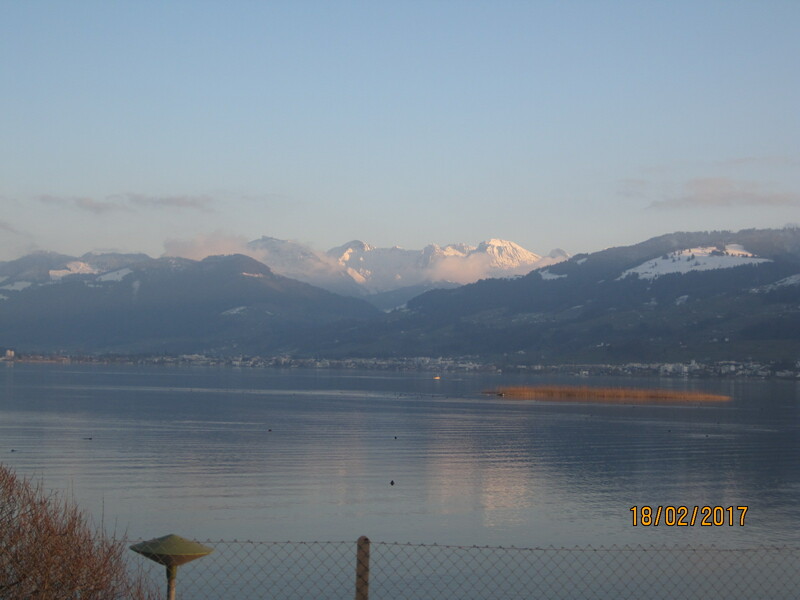 Anyway, we were in Switzerland last week. We being me and the kids. TBH was stuck at work, due to Lancashire and Cumbria opting for different half-terms. 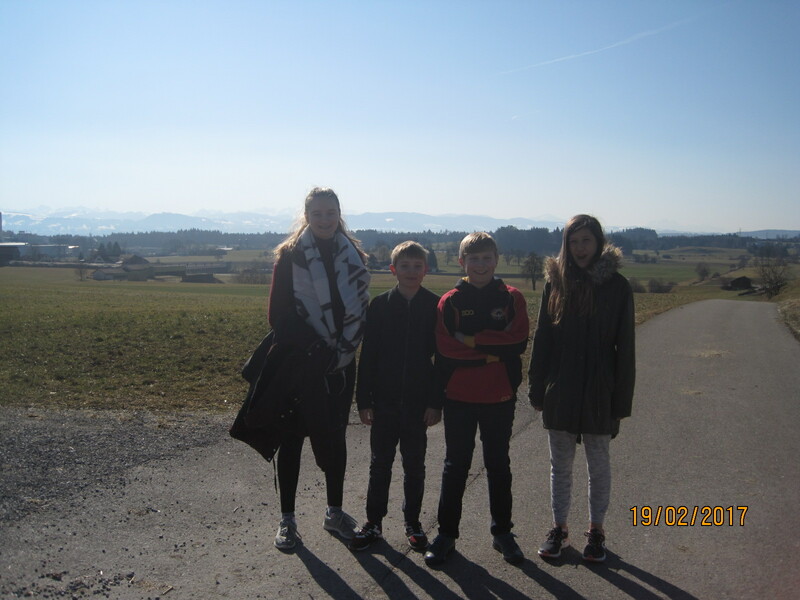 We were staying with my brother, who lives in Wetzikon near Zurich, and skiing with him and my niece and nephew. 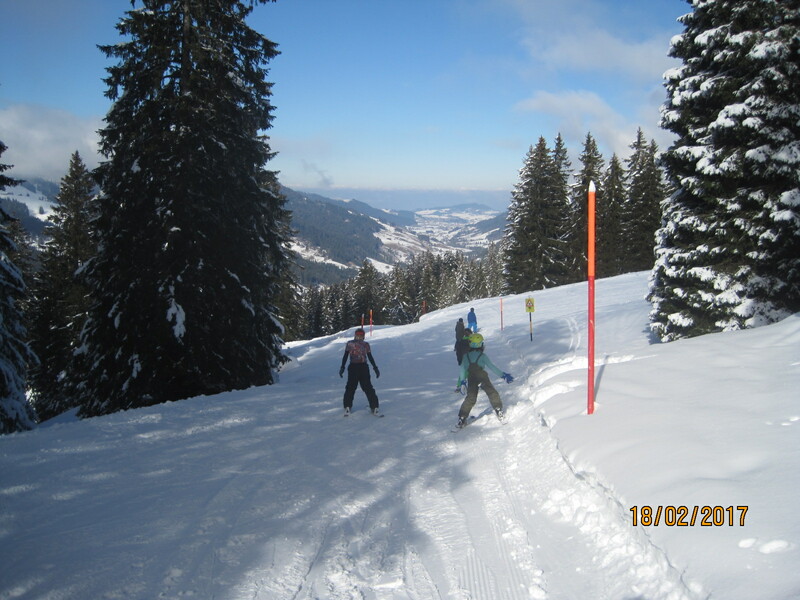 Which proved to be the perfect place for us to get reacquainted with skiing after several years’ absence. Behind A here you can see what we progressed to next…. 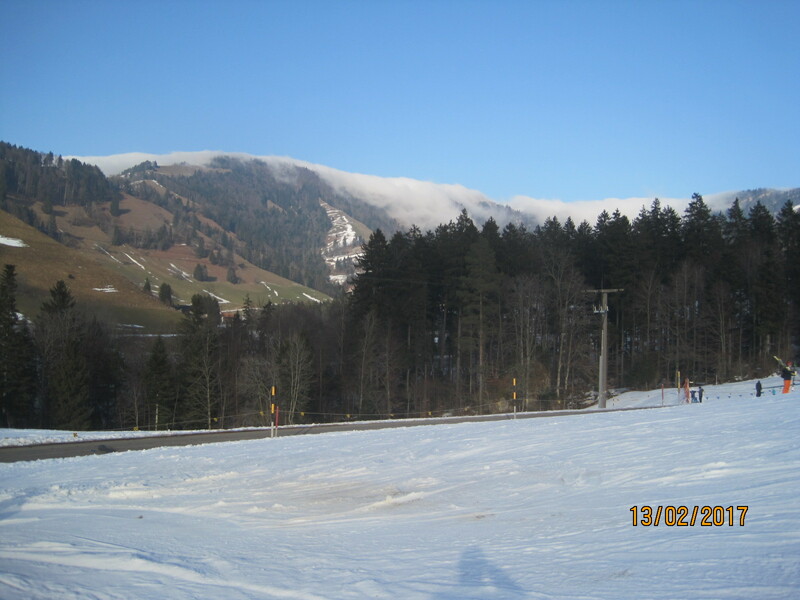 A rather steep button lift with a short steepish red run beside it and a much longer, gentler and more enjoyable blue run curling down the hillside and back to the nursery slopes. 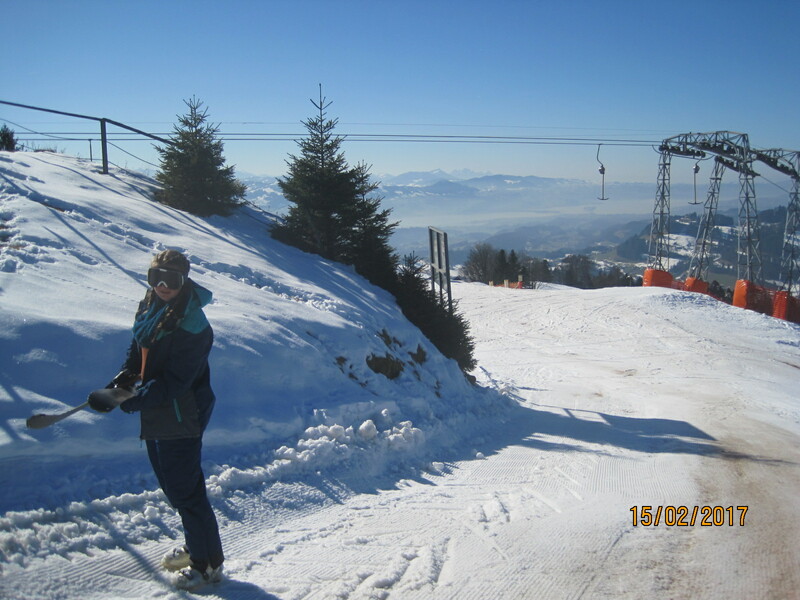 This is from our third day, when we’d moved on to the chair-lift. 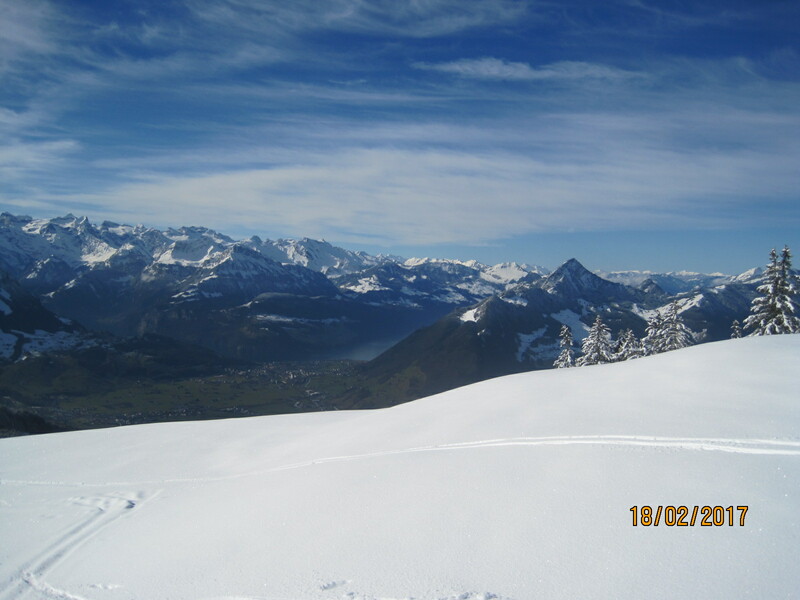 The views were excellent, but unfortunately the top of the runs here were steep, icy and bare in places and most of the group found them intimidating. 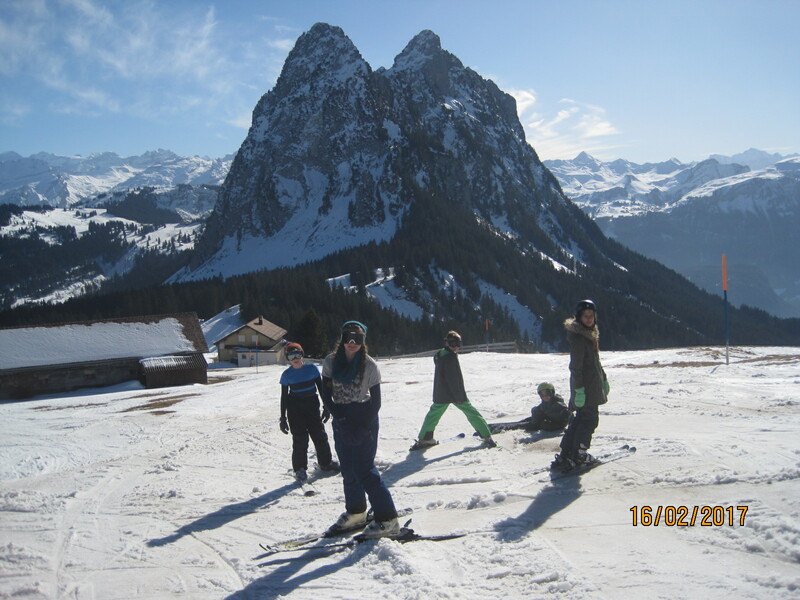 We split the party in two, some returning to the more friendly runs, whilst I stayed with the boys who after a tentative first descent, recovered their gung-ho approach and managed to squeeze in several pell-mell runs. 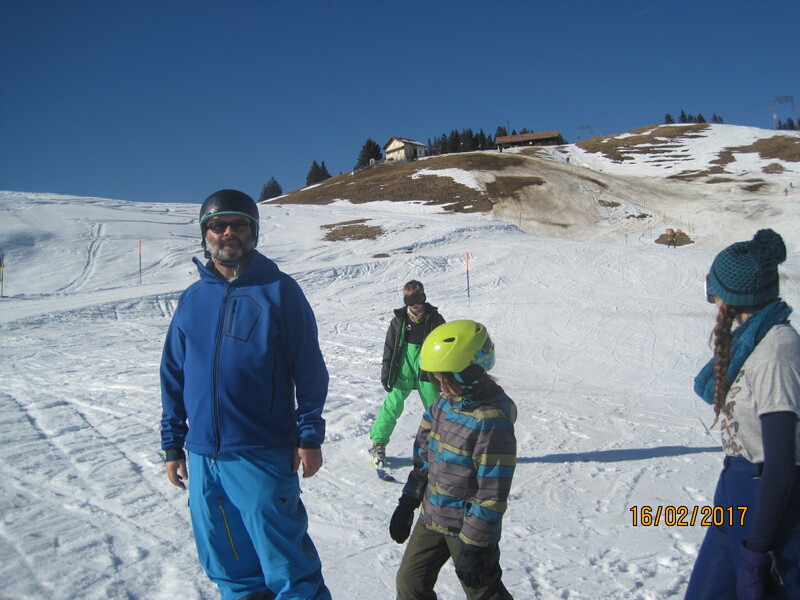 (Inevitably perhaps, it was actually me that injured myself in the end, making an error of judgement and coming over a slight rise much too quickly for my moderate skiing ability). 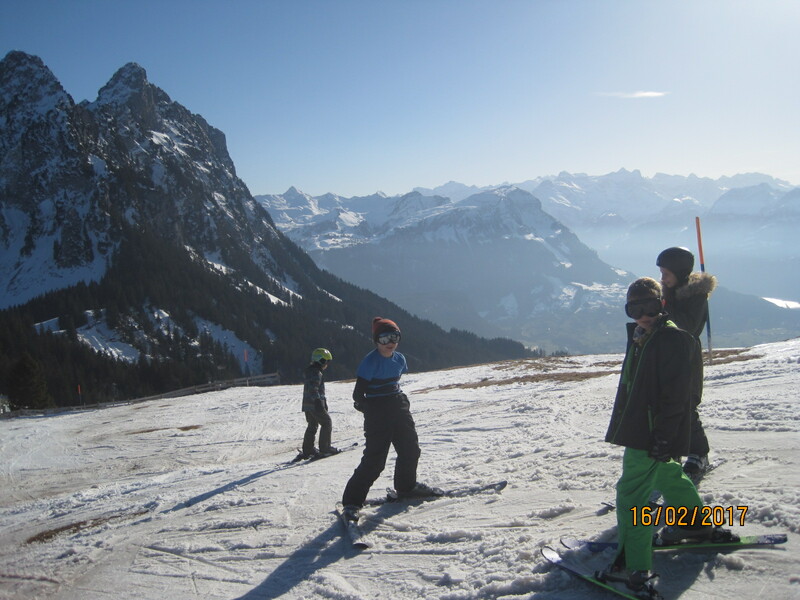 The boys also relished these small ramps which somebody had built close to the nursery slopes. With the snow deteriorating at Atzmännig, we decided to venture a little further afield. Brunni is around an hour’s drive from my brother’s and feels decidedly more Alpine in character than Atzmännig, which is in the rolling hills of the Zurich Oberland. 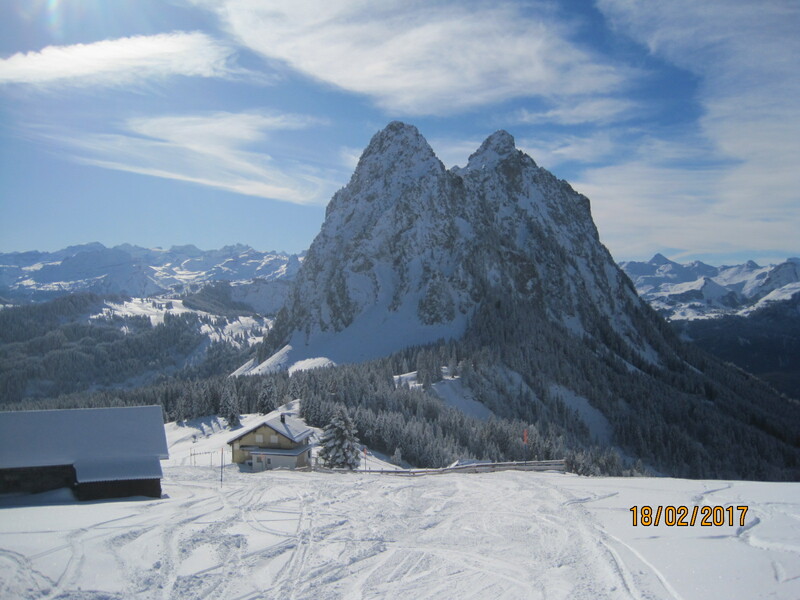 As you can see, I was very taken with this view of the Haggenspitz and the Kleine Mythen. 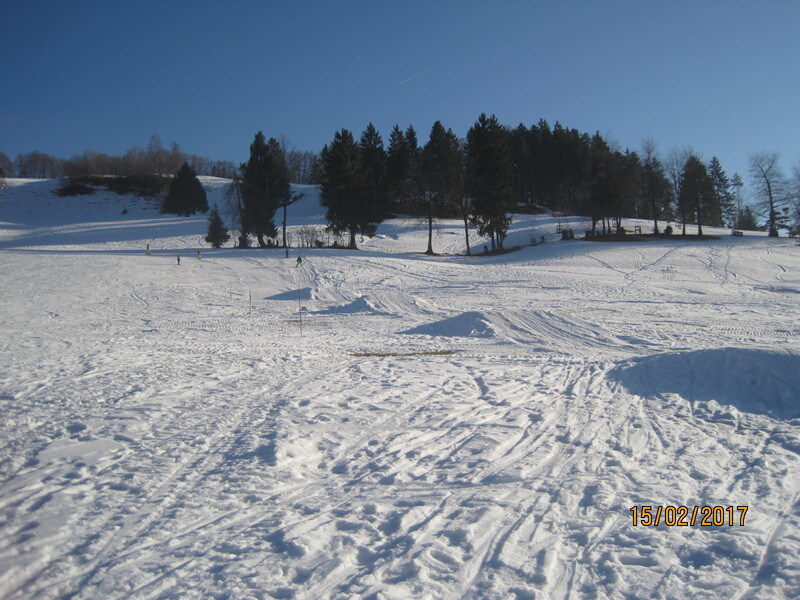 ..is taken from slightly further downhill and shows the parlous state of this piste, although fortunately, the rest of it was delightful. 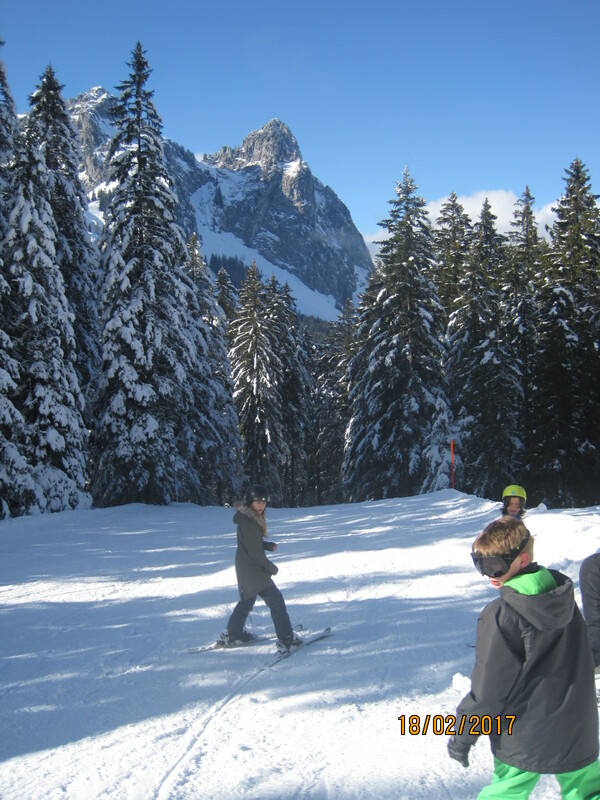 Generally, after skiing, the kids wanted to play video games or watch films. 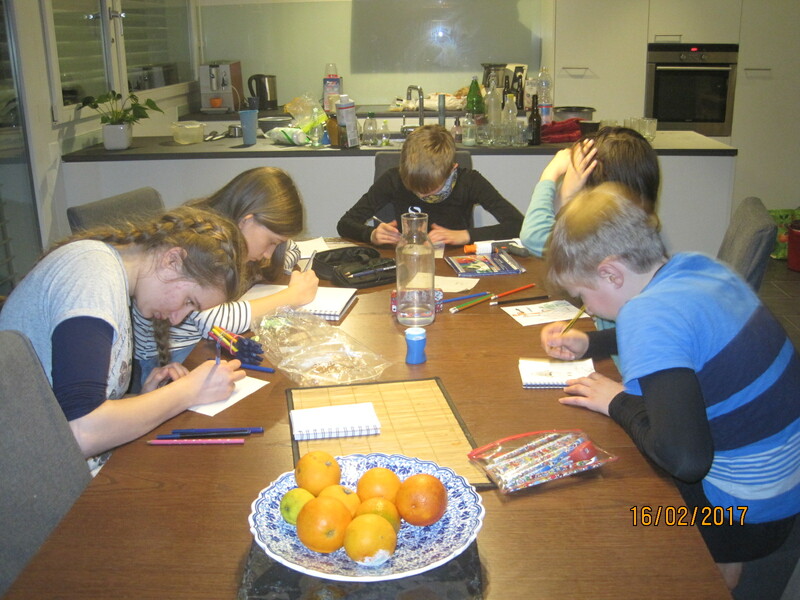 But on this occasion they all settled down to draw together. They were so absorbed in their art, I couldn’t resist a picture. 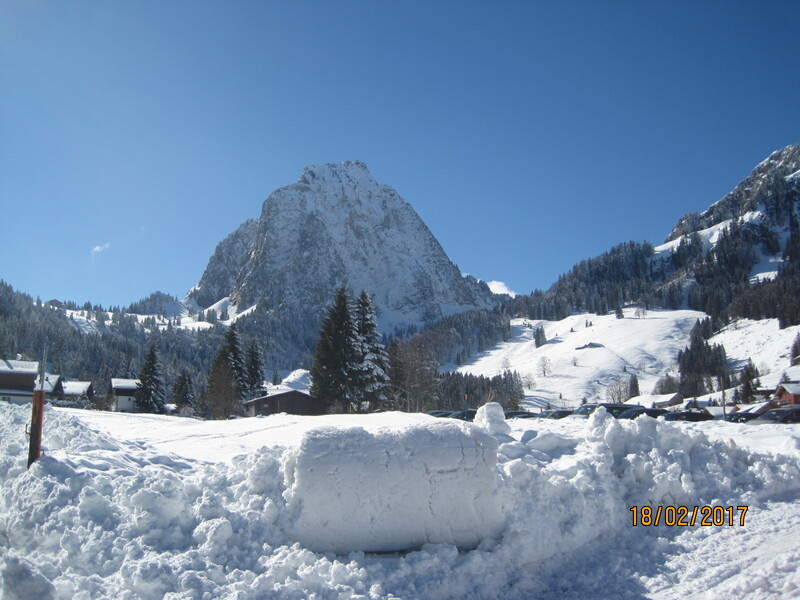 The following day brought torrential rain, or heavy snow at higher levels. We went to Satis Park, a sort of swimming pool. There was a wave pool, a heated outdoor pool (it was quite surreal, swimming outside as it snowed), a cascade ride and eight different slides. Obviously, the kids loved it. At one point I found myself on a slide on which I should have been seated on a rubber ring, but wasn’t – I fell off at the start. 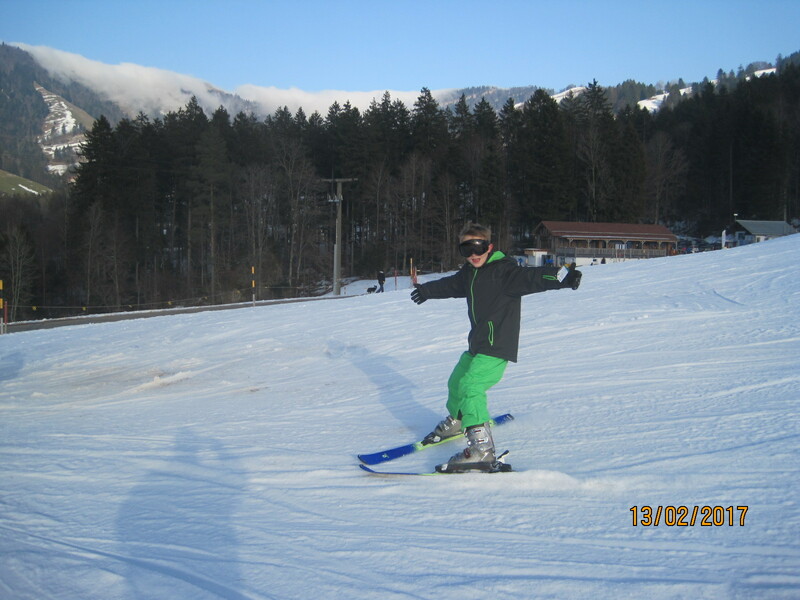 This was OK to begin with, although a bit rough, especially since I was already quite bruised from the skiing. OK that was, until the point where jets of water under the rubber ring drove it up a small slope. 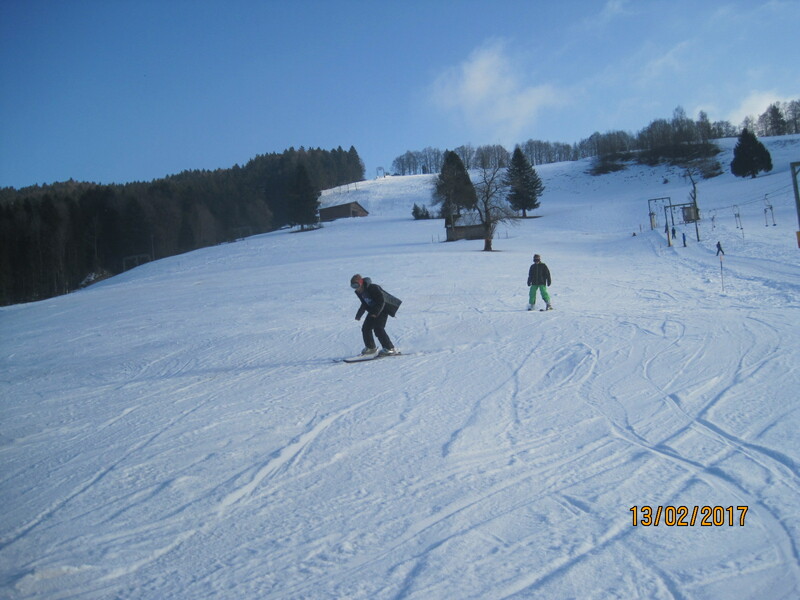 Without the rubber ring I didn’t go up the slope. The jets were remarkably effective at removing my trunks however. Fortunately, the slide was in an enclosed tunnel. Sadly, this section, and only this section, was transparent*. I managed to get to my feet, and retrieve my trunks, hopefully not in that order, only to be knocked down when the jets fired again. Eventually I managed to walk up the incline, narrowly avoiding being mown down by another slider, who was probably quite surprised to overtake me in the tunnel. It’s possible that I’m too old for this kind of thing. Anyway, the fresh snow was most welcome and the next day we returned to Brunni for what would turn out to be our best day of skiing of the trip (but sadly also our last). 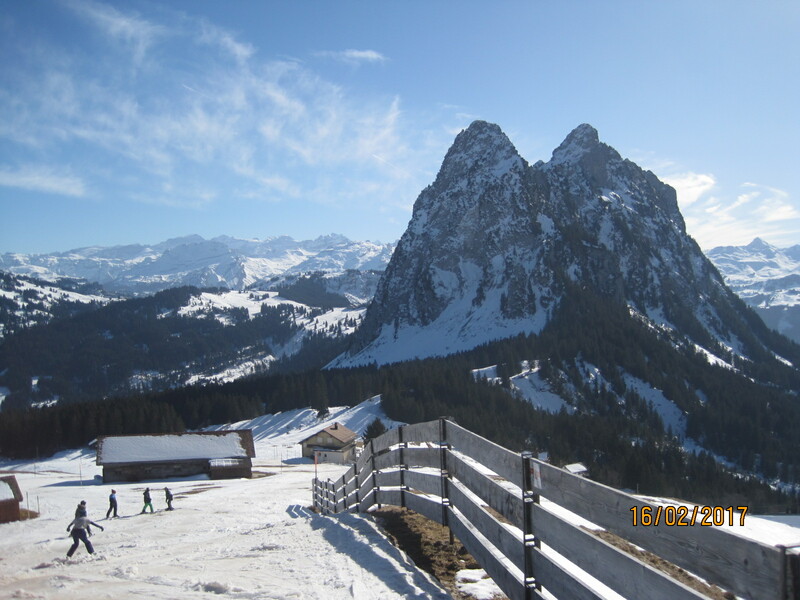 The Kleine Mythen and the Haggenspitz again. 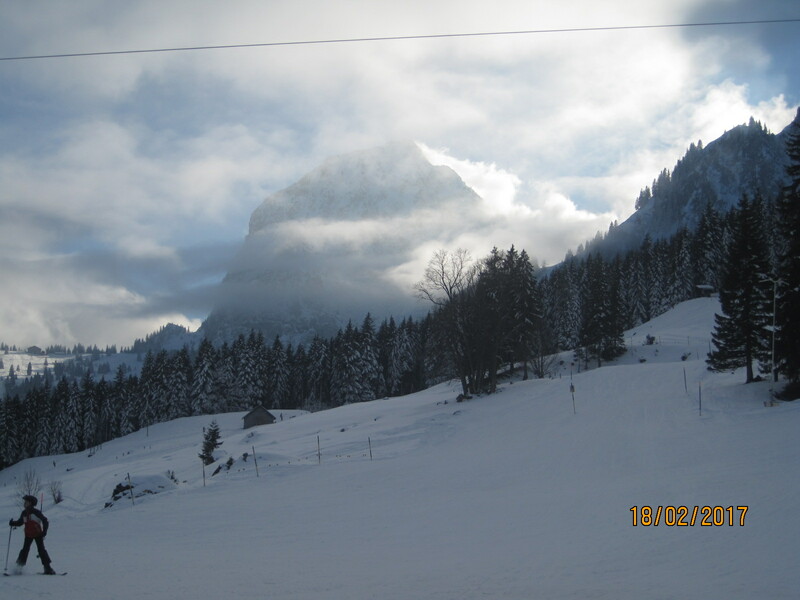 The Haggenspitz and the Kleine Mythen. Yet again. My brother has recently become the proud owner of a 7-seater VW California Beach**. 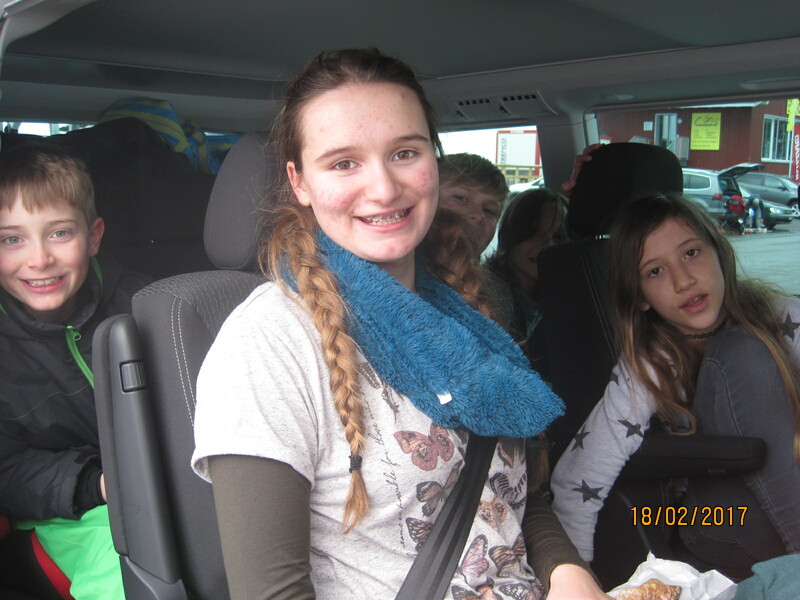 Since there were seven of us, this proved ideal and we travelled in style. The views during the drives were superb, especially on the way to and from Brunni. I was also constantly entertained by the huge number of Buzzards and Kites we saw during every journey. 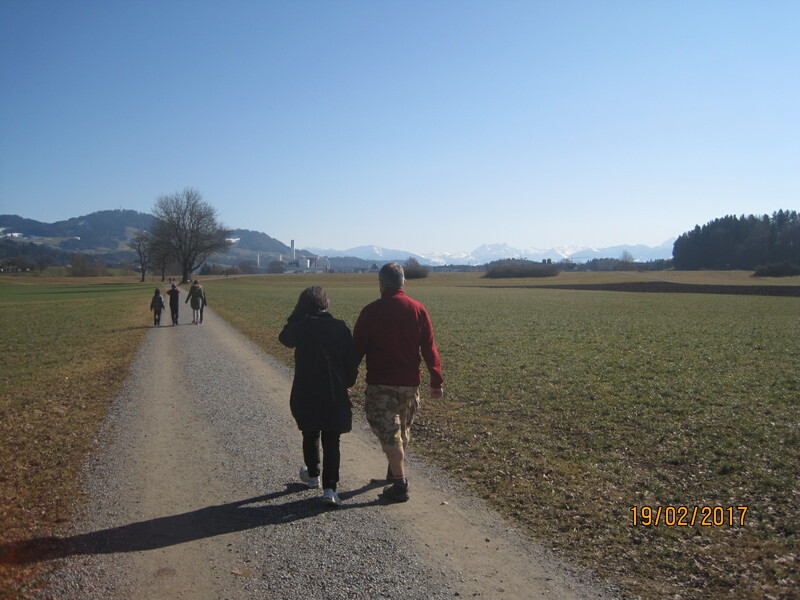 On the Sunday we had a lazy day, before our flight home, although we did manage to fit in a very pleasant stroll around Wetzikon in the sunshine. *At least my shorts didn’t disintegrate completely, which is what happened to our old friend Uncle Fester many years ago on one of the slides at the outdoor pool in Chamonix. ** I’m not jealous. Not remotely. Oh no. Not even a little bit. I presume you got home safely? I’ve never skied and to some extent regret it, but then I’ve always thought the odds on breaking a limb are off-putting, but perhaps that’s just sour grapes. Skiing is highly exhilarating, and is of course an environmental disaster, so you should probably congratulate yourself on not participating. I’ve yet to break a limb, although one previous injury was probably a factor in knee surgery I subsequently needed, and my shoulder is still pretty sore even now. 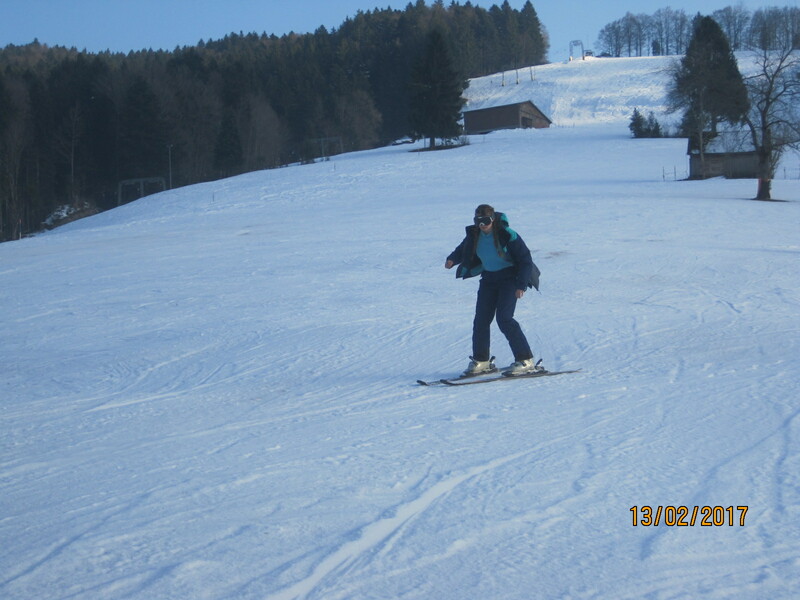 Your skiing near Zurich, reminded me of most my experiences on the Australian slopes – bare patches. LOL re the water park and sheer joy viewing the slopes after the fall of snow. Sensational views of Holzegg and the trail down. Oh dear – I’m afraid I didn’t even know that there was skiing in Australia. Makes sense though – I was at least aware that you have large mountain ranges. I had a wild camp in a thunderstorm on the slopes of Pic du Midi on my GR5 walk (2005)- memorable! 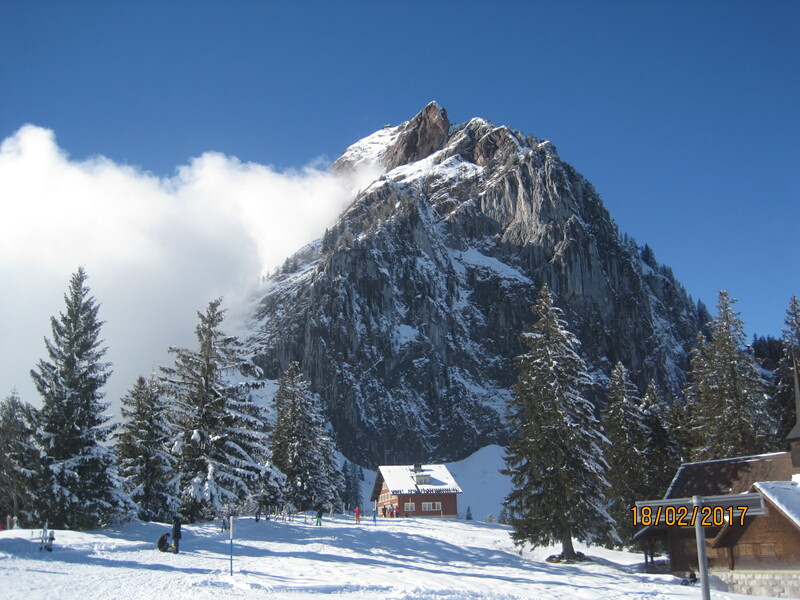 TBH and I stayed in the ‘hut’, (basic hotel) on Pic du Midi on a Pyrenean walk we did pre-kids. 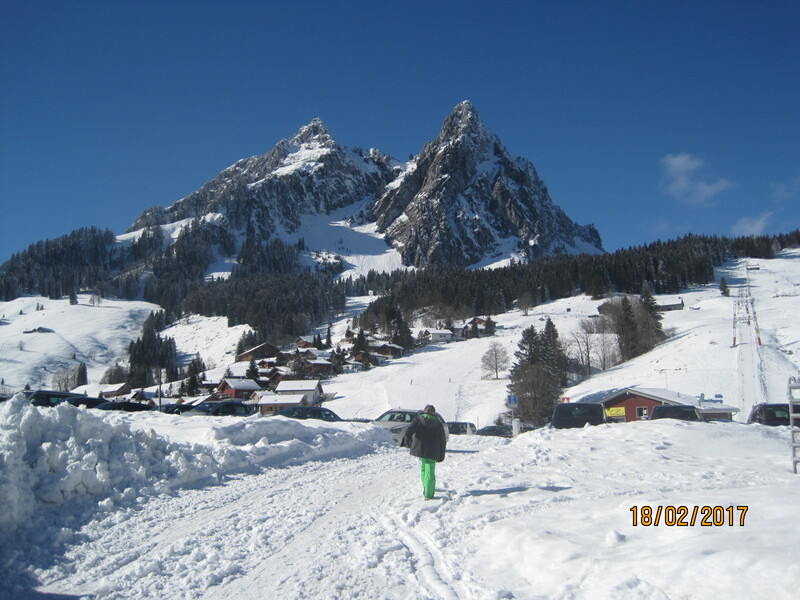 That was at the end of a very long days walking (2400m of ascent) and we were very glad to get there. Stunning mountain though. Good comparison Andy. The three rocky peaks there really were spectacular, even if they are ‘small’ by Alpine standards. You would have enjoyed it Andy, although it really would have been ‘cosy’ in Steve’s apartment. I once took a party of U16 rugby players to a pool with a slide that featured a clear panel. I was first alerted to their new amusementof high speed mooning when I saw people pointing up to the panel and laughing. I’m hoping that this is on aspect of rugby culture which my own boys never adopt!